David Amram (born November 17, 1930) is an American composer, conductor, multi-instrumentalist, and author. As a classical composer and performer, his integration of jazz (including being one of the first noted as an improvising jazz French hornist), folkloric and world music has led him to work with the likes of Dizzy Gillespie, Lionel Hampton, Willie Nelson, Langston Hughes, Charles Mingus, Pepper Adams, Leonard Bernstein, Sir James Galway, Tito Puente, Mary Lou Williams, Joseph Papp, Arthur Miller, Arturo Sandoval, Stan Getz, Pete Seeger, Elia Kazan, Christopher Plummer, Henry Kissinger, Ingrid Bergman, Odetta, Lord Buckley, Dustin Hoffman, Steve Allen, Machito, Earl "Fatha" Hines, Allen Ginsberg, Nina Simone, Gregory Corso, Bob Dylan, Steve Goodman, Gerry Mulligan, Sonny Rollins, T.S. Monk, Hunter S. Thompson, Johnny Depp, Levon Helm, Betty Carter and Jack Kerouac. In the early 1950s, he was encouraged to pursue his unique path by mentors Charlie Parker, Thelonious Monk, the New York Philharmonic's conductor Dimitri Mitropoulos, Miles Davis, Aaron Copland, Gunther Schuller, and visual artists Jackson Pollock, Joan Mitchell, Willem de Kooning and Franz Kline. Today, as he has for over 50 years, Amram continues to compose music while traveling the world as a conductor, soloist, bandleader, visiting scholar, and narrator in five languages. Amram is mentioned in the popular children's song "Peanut Butter Sandwich" by Raffi, in the line "one for me and one for David Amram". David Amram has composed more than 100 orchestral and chamber music works, written many scores for Broadway theater and film, including the scores for the films Splendor in the Grass and The Manchurian Candidate; two operas, including the Holocaust opera The Final Ingredient, a comic opera Twelfth Night with a libretto by Joseph Papp; and the score for the 1959 film Pull My Daisy, narrated by novelist Jack Kerouac. He is also the author of three books: Vibrations, an autobiography; Offbeat: Collaborating With Kerouac, a memoir; and Upbeat: Nine Lives of a Musical Cat, all published by Paradigm Publishers. He is currently writing his fourth book, "David Amram: The Next 80 Years," to be published in 2014. Some of Amram's most critically acclaimed recent orchestral works include Giants of the Night, a concerto for flute and orchestra (commissioned and premiered by Sir James Galway in 2002); Symphonic Variations on a Song by Woody Guthrie, (commissioned by the Woody Guthrie Foundation and premiered in 2007); and Three Songs: A Concerto for Piano and Orchestra (written for and premiered by pianist Jon Nakamatsu in 2009). Currently Amram is working on a new orchestral piece, a new chamber work, and is participating in releases of a new series of CDs of his orchestral chamber music and jazz compositions. Violin virtuoso Elmira Darvarova and members of the New York Philharmonic and Metropolitan Opera Orchestra participated in the annual New York Chamber Music Festival, performing an evening of Amram's chamber works at Symphony Space in New York City, to be released as a CD in 2013. Amram guest conducted the Colorado Symphony Orchestra in Denver in a program which included his "Symphonic Variations on a Song by Woody Guthrie" and "Theme and Variations on Red River Valley," for flute and strings, both of which will appear on a new CD of Amram's music in 2013. The Boston Symphony's classical saxophonist Kenneth Radnofsky has commissioned Amram to compose a new work, "Greenwich Village Portraits," to be premiered worldwide February 1, 2014, by forty different saxophone soloists in forty different venues, sponsored by The Worldwide Concurrent Premieres and Commissioning Funds, Inc. There are plans to release a CD of Amram's symphonic and chamber compositions for saxophone with Radnosky as the soloist in 2013. Radnofsky also appears with Sir James Galway, Pete Seeger, Kurt Elling, Buck Henry, Tiokaskin Ghost Horse, Floyd Red Crow Westerman, David Broza, Candido, Bobby Sanabria, the Queens College Orchestra (conducted by Maurice Peress and Candido), singers and players from the LSU Opera, and other artists, in Lawrence Kraman's new documentary feature film David Amram: The First 80 Years. Amram also appears in Andrew Zuckerman's book and new feature film documentary Wisdom: The Greatest Gift One Generation Can Give To Another, as one of the world’s 50 Elder Thinkers and Doers, and his instructional video, Origins of Symphonic Instruments, released by Educational Video, is shown in over 6,000 schools throughout the United States and Canada. Amram's many honors include the borough president of Brooklyn's creating David Amram Day in 2009, celebrating Amram's 29 years as the Brooklyn Philharmonic's conductor and narrator for free school, community, and parks concerts, pioneering world music and soloists of many genres with the European classics presented by the Brooklyn Academy of Music. The Music Division of the New York Public Library for the Performing Arts at Lincoln Center has acquired the complete archive of David Amram's manuscripts, scores, recordings, videos, photographs, and artwork. There are plans for an exhibition, and the archive provides the opportunity for scholars and the general public to study his work. All of his concert music is published by C. F. Peters Corporation. Douglas A. Yeager Productions Ltd represents Amram for all of his live appearances and residencies. Amram is also the recipient of six honorary Doctorates. Amram was featured in Raffi's hit song "Peanut Butter Sandwich Made With Jam: One for Me and One for David Amram." ^ a b Ginell, Richard. 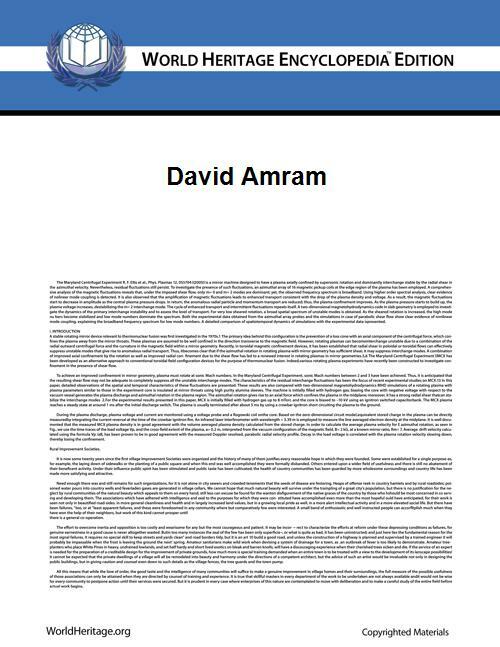 "David Amram: Biography". Allmusic. Retrieved October 17, 2011. ^ Bratman, David (October 2, 2007). "Variations on This Land". San Francisco Classical Voice. Retrieved October 17, 2011. ^ "2008 – 2009 Season". Symphony Silicon Valley. Retrieved October 17, 2011.